In light of the risk Florence and Olivia pose to the U.S., we’re publicly releasing our morning briefings on our blog. Check back daily for more updates. Hurricane Florence has been rapidly strengthening over the past several hours out in the west-central Atlantic. 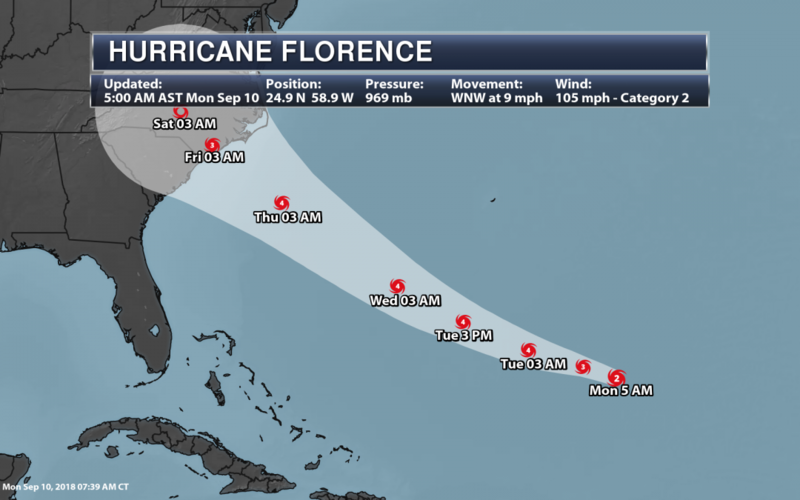 As of the 5 AM AST update from the National Hurricane Center, Florence had winds of 105 mph and was moving to the west-northwest at 9 mph. Florence will continue to strengthen over the next couple days, becoming a Category 4 hurricane with peak winds of 150 mph by Wednesday. 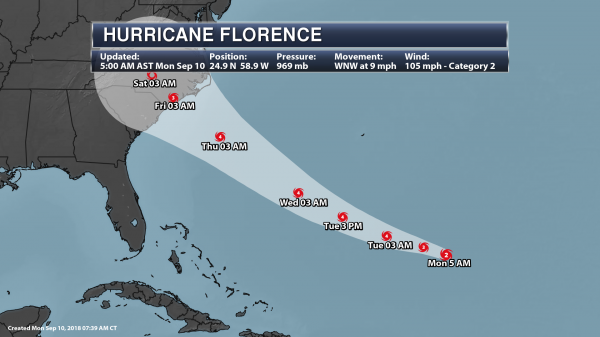 Some slight weakening is possible after that, but it is expected to be a major hurricane as it makes landfall along the Mid-Atlantic coast – potentially near the North/South Carolina border – late Thursday. Hurricane-force wind gusts (74mph+) can be expected in and around the area of landfall Thursday evening. Areas that have the highest potential of receiving these winds would include Wilmington, Jacksonville, and Elizabethtown (NC) and Myrtle Beach (SC). 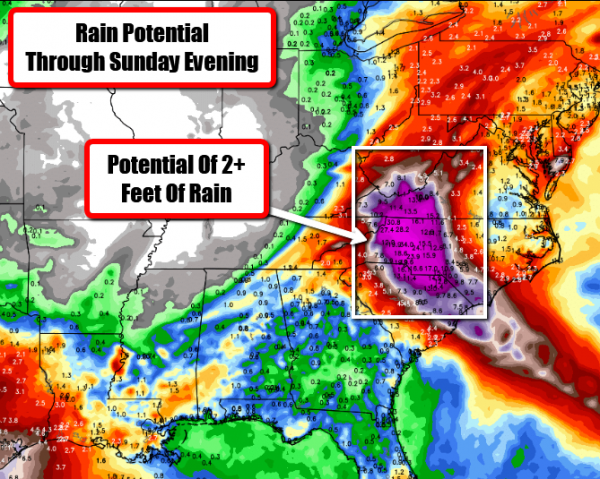 Heavy rain and inland flooding, especially if Florence slows down/stalls out across the Mid-Atlantic into the weekend. Some areas could receive at least one to two feet of rain if this occurs, leading to disastrous flooding. This could include areas like Charlotte (NC) and Wytheville (VA). A coastal storm surge of 5-10+ feet will be possible along and especially to the north of where Florence makes landfall Thursday along the North Carolina coast, particularly in areas from Wilmington to Morehead City, New Bern, and Bath. We are also tracking Hurricane Isaac in the Atlantic, which could impact the Lesser Antilles later this week. Hurricane Olivia has strengthened a little in the Central Pacific, but weakening is expected over the next couple days. This system will impact Hawaii as a strong tropical storm by the middle of the week. Tropical Storm Watches are in effect for Oahu, Maui County, and the Big Island. Typhoon Mangkhut is impacting the Mariana Islands and Guam today and could have impacts on southeastern Asia into the weekend. Hurricane Florence is quickly strengthening in the west-central Atlantic and appears likely to have impacts on the East Coast as a major Hurricane later this week. 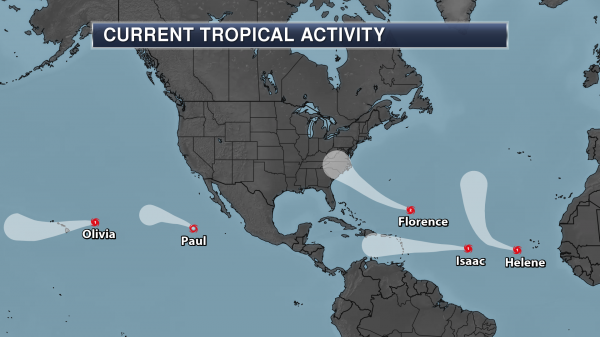 Hurricane Helene continues to move west-northwest over the eastern Atlantic. This system is expected to strengthen over the next several days, continuing to the west-northwest and northwest with no impact to land. Hurricane Isaac will continue to strengthen through about midweek. This system could impact the Lesser Antilles later this week. Hurricane Olivia has strengthened a little in the Central Pacific, but weakening is expected over the next couple days. Olivia will impact Hawaii as a strong tropical storm by the middle of the week. Tropical Storm Paul is weakening in the eastern Pacific and will not impact land over the next five days. It is important to not focus directly on the exact location of landfall, though, as the exact path is still uncertain this far out. 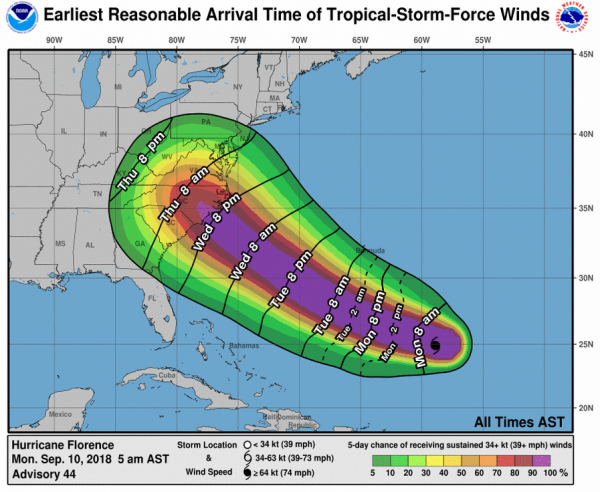 Anywhere within the cone of uncertainty – extending across North and South Carolina – can expect impacts from this system which will include storm surge at the coast, inland heavy rain and flooding, and damaging winds topping hurricane force. Facilities along the East Coast – especially across the Carolinas and Mid-Atlantic – should make sure their contingency/hurricane plans are in place. Conditions are likely to worsen across this region as we head into Wednesday night and Thursday. Potential Earliest Tropical Storm Force Winds. Tropical storm force winds will approach the East Coast by Wednesday evening, with stronger winds following Thursday into Thursday Night. By this time frame, most preparations should be completed, as these winds will impact any last minute preparations. As winds increase across the region where Florence approaches the coast, power outages and downed trees will be likely. Category 3+ Wind Gusts Possible At Landfall. Major hurricane wind gusts can be expected in and around the area of landfall Thursday evening. 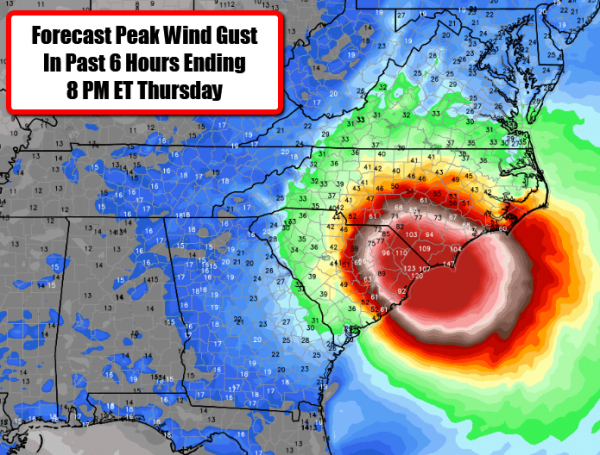 According to this model, winds of over 100 mph may be possible for areas like Wilmington, Jacksonville, and Elizabethtown (NC) and Myrtle Beach (SC). These winds would be capable of knocking out power to the region, as well as downing trees and power lines. Storm Surge Potential. As Florence approaches the coast Thursday, a destructive storm surge will be possible. Storm surge flooding occurs when rising waters move inland, causing normally dry areas to be flooded. 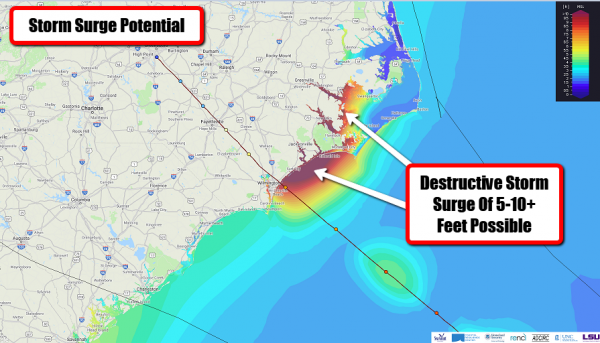 Models are indicating the potential of a 5-10+ foot storm surge along parts of the North Carolina coast, particularly in areas from Wilmington to Morehead City, New Bern, and Bath. Heavy Rain Impact. Florence is expected to produce heavy rain along the coast as well as inland, especially as the system slows down toward the end of the week and the weekend. In some areas, this rain could last for days if this system does stall out as some models are showing. One other thing to note is that terrain may enhance the potential of heavy rainfall across this region into the weekend. Rainfall totals of one to two feet may be possible in the most concentrated areas of heavy rain inland, which could cause disastrous flooding. Tracking Isaac. Isaac is now a hurricane as of Monday morning in the central Atlantic, continuing to move westward. Some additional strengthening is possible over the next couple days, with the forecast showing a peak intensity of 90 mph winds about 36-48 hours from now. After that, slow weakening should start to occur. 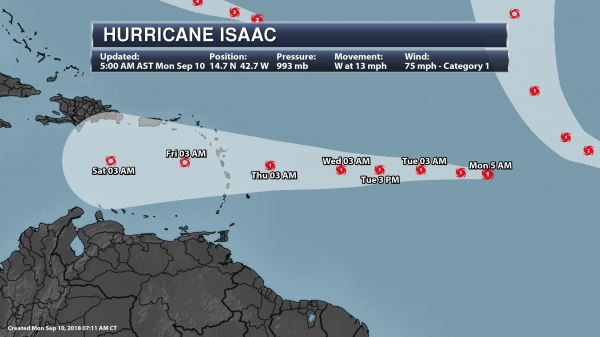 Isaac should move across the Lesser Antilles Thursday at or near hurricane intensity. However, with Isaac being a small hurricane, there is uncertainty in the overall forecast of the system. Potential Formation In The Gulf? There is also an area in the Caribbean that we will have to watch closely as it moves into the Gulf of Mexico later this week. 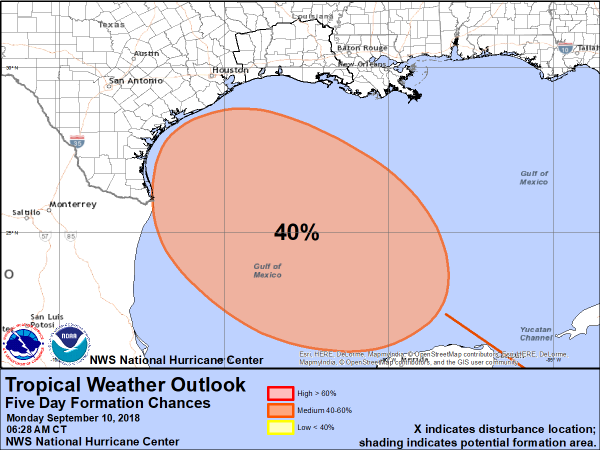 There is about a 40% chance that a tropical depression could form in the Gulf of Mexico over the next five days. Tracking Olivia. Out in the Central Pacific, Olivia continues to move west this morning and has strengthened a little. 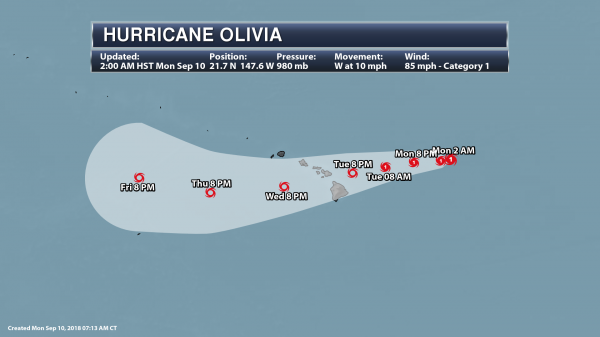 As of the 2 AM HST update, Olivia had sustained winds of 85 mph and was moving to the west at 10 mph. The center of the storm was located 500 miles east-northeast of Hilo. This system will start to move more to the west-southwest later today, moving across the Hawaii Islands TuesdayNight or Wednesday. Little change in strength is expected today, but Olivia should start to weaken again Tuesday. 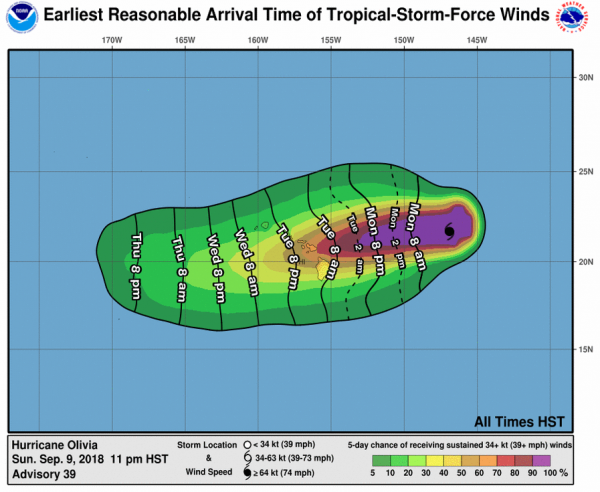 It is currently expected that Olivia will still be a strong tropical storm as it moves over Hawaii, with forecast wind speeds of 70 mph Tuesday evening and 50 mph Wednesday evening. Tropical Storm Watches. Since Olivia will track directly over the Hawaiian Islands later this week, Tropical Storm Watches have been issued for Oahu, Maui County, and the Big Island. Tropical storm conditions will be possible within this watch area as soon as Tuesday. The greatest threats with Olivia will be strong winds and heavy rainfall. Potential Earliest Tropical Storm Force Winds. As Olivia tracks closer to Hawaii over the next couple days, tropical storm force winds could be felt as soon as Tuesday across the islands. These winds would start to disrupt preparations ahead of the storm. Olivia Potential Wind Gusts. Some of the strongest wind gusts across the Hawaiian Islands are expected Tuesday night into Wednesday, with gusts topping 50 mph possible in Honolulu late TuesdayNight into the day Wednesday. Winds will start to decrease across the islands by Wednesday Night as Olivia continues to push to the southeast. Rainfall Potential. 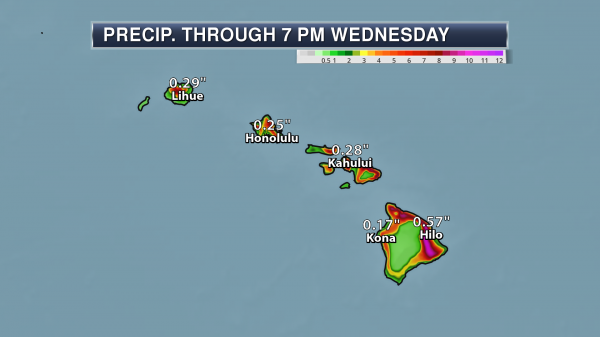 The potential exists for 10-20” of rain, especially in windward sides of Maui and the Big Island. This heavy rain could cause flash flooding across this region. 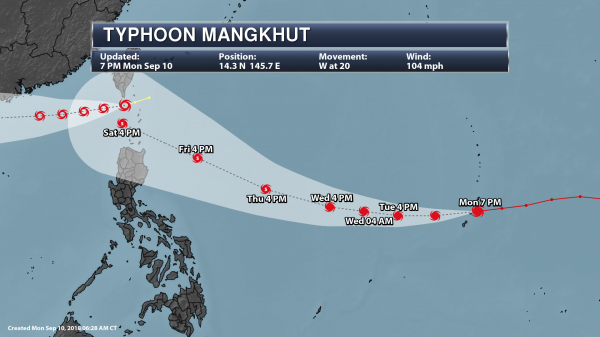 Tracking Mangkhut. Further out into the Pacific, Typhoon Mangkhut continues to intensify as it moves through the Mariana Islands and Guam. As of the 7 PM local time update, Mangkhut was located about 15 miles west of Rota or 50 miles north-northeast of Guam and was moving to the west at 20 mph with 105 mph winds. In Guam, a wind gust of 87 mph was observed at Andersen AFB with a 74 mph gust at the Guam International Airport. Typhoon to near-typhoon winds are expected to continue through Tuesday morning across Guam and the Mariana Islands as Mangkhut continues to move westward. Mangkhut is expected to become a Super Typhoon (winds of at least 150 mph) Thursday, and it could be a threat to Southeast Asia, including Taiwan, heading late in the week into the weekend.